Folks in the prog world will be doing hand stands, dancing in the streets, throwing wine and cheese parties in celebration of this collaboration. 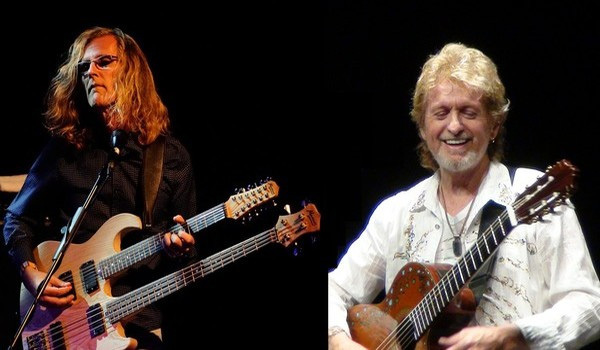 Legendary Yes vocalist Jon Anderson joins with modern melodic progressive rock composer and multi-instrumentalist Roine Stolt of The Flower Kings and Transatlantic fame. Encouraged by InsideOut Music label owner Thomas Waber, the duo worked together since 2014 to create Invention Of Knowledge. While, generally, I liked this album, fans of either artist are probably not going to like some of comments I make about it. And that's hard for me. I like Jon Anderson's work with Yes, though I never liked much of his solo stuff. I remember rushing to get his first solo album, Olias Of Sunhillow, back in 1976. (Yes, I'm that old.) What a disappointment. I didn't touch anything until 1985's Three Ships which, with some sage wisdom, I borrowed first from a friend. I did not care for that album at all. So I was done with Jon Anderson for going on 30 years. On the other hand, with Roine Stolt, I like most anything he's involved with, especially The Flower Kings, The Tangent, and Transatlantic. I've never heard his solo stuff. But, he's almost in the category of "he can do now wrong" when it comes to music. From the press material, apparently Mr Waber was wanting an album of "Yes music" from the pair. 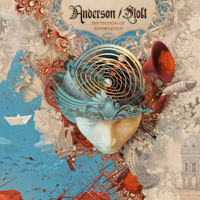 In some sense, Invention Of Knowledge does sound much like Yes, mostly from Anderson's voice and vocal arrangements. Anderson's voice is one of that is undeniably recognizable. Yet, even the music my reflect that iconic band as well as it weaves the gentleness of melody and harmony with intricacy of developed compositions. But alternatively, with Stolt in there echoes of The Flower Kings is heard, notably in the timbre of his guitar. So then there's an abundance of melody, harmony, groove, light complexity, symphonic nuance, and those vocal arrangements. It's perhaps best to call Invention Of Knowledge classic 70's melodic progressive rock revisited and reinvented for the 21st century and so pointing to it's timeless beauty and relevance. But, having written that last paragraph, here's where I land with Invention Of Knowledge. I thought it was kind of boring, kind of monotonous. I mean there's much going on, but it all seemed to run together in both vocal and musical arrangements. You know how when you're walking through an enclosed shopping mall and there's music playing in the background you both notice and not notice it? That's how I felt about this album. Some of this was came from Anderson's voice. He always sounds the same to me, like there's no depth or variation to his intonations. But the thing is, there is. So it's not that. It's the sound of his voice. It kind of lulls me into ambivalence and complacency. So that's it. Otherwise, as I said earlier for classic Yes-like melodic progressive rock, fans of the same will love this album. For me, spinning it another few times may wash away my ambivalence. Having the lyrics would have been a bonus too. It's perhaps best to call Invention Of Knowledge classic 70's melodic progressive rock revisited and reinvented for the 21st century and so pointing to it's timeless beauty and relevance.